A rescued pangolin is released by government conservation officers in North Sumatra, Indonesia on July 31, 2012. Police intercepted 85 endangered pangolins, most of them alive despite being stuffed into sacks by suspected smugglers. MONG LA, Myanmar — “It’s delicious,” the Chinese waitress says, pointing at the three metal cages on the pavement. Inside each is a pangolin — an odd-looking creature that, over the past decade, has become the most heavily trafficked wild mammal in the world, according to the International Union for Conservation of Nature (IUCN). At the moment, each pangolin resembles a ball about the size of a melon, covered in crocodile-like scales. Sensing danger, the three animals have instinctively curled themselves into tight balls. In the wild, this reflex protects them from predators like bears and large cats. But there’s little defense against wildlife traffickers and well-heeled diners hoping to taste a rare and exotic meat. This neon-soaked eatery in Mong La, a shabby town in a tiny rebel-held fief on the China-Myanmar border, is just one end-point of a global trade that is pushing the pangolin to the brink of extinction. The main trigger: a soaring demand for their scales and meat, mostly from China and Vietnam. “The species here in Southeast Asia are getting absolutely hammered by a very large-scale, well-organized, systematic collection and trade to supply demand in China,” says Chris Shepherd, Southeast Asia regional director of the wildlife protection organization TRAFFIC. In Mong La, pangolins are openly sold in restaurants to border-hopping Chinese tourists. Nearby wildlife boutiques sell pangolin skins and scales immersed in rice wine. At the open-air central market, one Chinese trader offers to sell me the skin of a Sunda pangolin, listed as “critically endangered” by the IUCN, for 200 yuan (about US$32). “Here, feel how soft it is,” she says, running her hands over the grey scales. A shy, nocturnal animal, the pangolin has a long snout, tough outer scales, and snaking tongue, which it uses to lick up insects. In China, where it is known as lingli, or “hill carp,” in reference to its scaly exterior, pangolin meat has long been prized. The creature’s scales — made from keratin, the same substance as human fingernails and hair (as well as Rhino horn) — are also prescribed by traditional doctors to treat skin disorders and other ailments — despite lacking medical benefits. The trade in pangolin parts from Southeast Asia to Hong Kong and China has taken place since at least the early 20th century, according to Dan Challender, co-chair of the IUCN’s Pangolin Specialist Group. From the 1950s to the 1980s, Challender says, pangolin skins were also exported in small quantities to the US and Mexico, where they were used to make shoes and clothes. 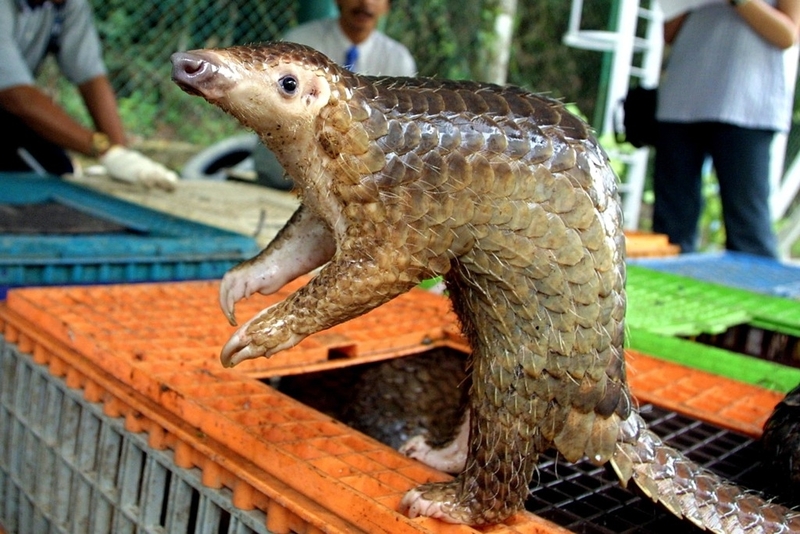 The “official” exports of these products came to an end in 2000, when the trade in wild-caught pangolins was effectively banned under the international wildlife treaty CITES. But with China’s boom, demand for pangolins has skyrocketed. For many middle-class Chinese, consuming black-market pangolins is now considered a sign of wealth and status, says Challender, who is writing his PhD on the global pangolin trade. While conducting research in Vietnam in 2012, Challender witnessed a diner pay $700 for a two-kilogram pangolin. “The creation of urban luxury markets for wild meat, especially where wild meat has been consumed historically, has been a key driver in the trade of pangolins,” he says. To meet increased demand, pangolins are now harvested and processed illegally on an industrial scale. In one week in March 2008, Vietnamese officials confiscated 23 tons of pangolins at Hai Phong port, part of a shipment making its way from Indonesia to China. In 2010, another 7.8 tons of frozen pangolins were seized in southern China, along with 1,800 kilograms (nearly 4,000 pounds) of scales. Similar hauls have been made more recently en route to the Chinese market. In a June report, the Pangolin Specialist Group estimated that more than a million pangolins have been taken from the wild over the past decade, and that populations across Asia were in “precipitous decline.” Of the eight pangolin species, the IUCN now lists four as vulnerable, two as endangered, and two as critically endangered. With pangolin supplies in China and nearby countries dried up, wildlife traffickers have looked further afield. The newest frontier is Africa. People in countries like Gabon, Kenya, Cameroon, Nigeria, and the Central African Republic have grown more aware of the value of pangolins to international traffickers. So far this year, more than six tons of African pangolin scales have been seized prior export to Asia — more than the combined total of all previous seizures on the continent. “The pull from China is getting bigger and bigger, and stretches wider and wider,” says Vincent Nijman, a zoologist at Oxford Brookes University in the UK who has studied the wildlife trade in Southeast Asia. “The worrying thing is the scale of it. The worrying thing is the number of countries from which African pangolins have been [taken],” he says. Conservationists say that despite occasional large seizures, and despite pangolins being protected by law in every Asian country other than Brunei and Bhutan, dismantling wildlife trafficking networks remains a low priority. In Cambodia, Toby Eastoe of Conservation International works with forestry rangers in the thickly-forested Cardamom Mountains, one of the few places in the country where significant populations of pangolins remain. Despite all of this, there is some reason for optimism. Awareness of the pangolin’s plight is greater than it has ever been—the necessary first step to the effective enforcement of wildlife laws. And while pangolins only produce one offspring at a time, they can breed in the wild quite quickly, meaning that populations could potentially bounce back quickly if hunting pressure is alleviated.